“Heirlooms passed from parents to daughters-to-be. Investment pieces for future generations. At Orient we are proud witnesses of happy occasions. We have watched five decades of wide-eyed young brides turn into doting mothers and return with their daughters-to-be to buy Si Dian Jin 四点金. 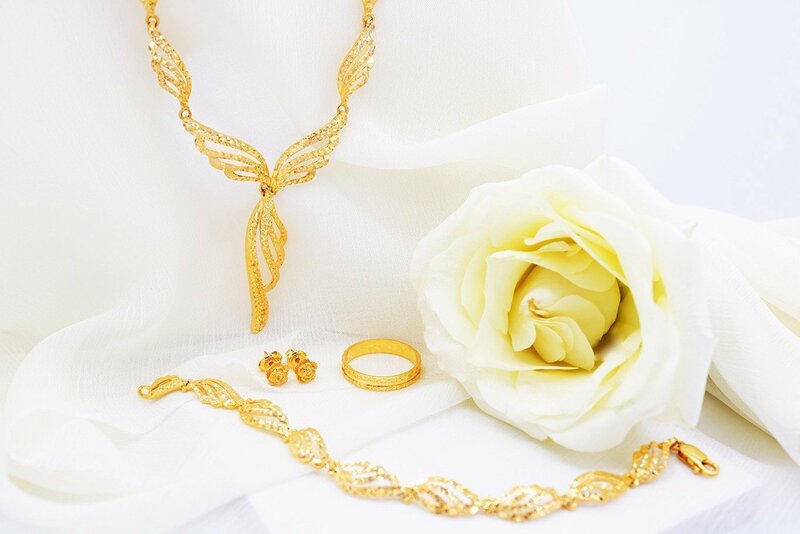 Our Si Dian Jin 四点金 sets are Pure and 916 Gold that ably retain their investment value. We also have diamond and jade jewellery sets for a bride who dares to be different. The Chinese culture is steeped in traditions. Si Dian Jin 四点金 originates from the Teochew provinces in China. Gifted as a financial security blanket from the groom’s parents to prospective daughters, gold was chosen for its enduring investment value in times of financial turmoil. Befitting a bride who wishes for a touch of tradition and old world charm, this collection comprises of one of our best selling necklaces that looks outstanding with a traditional kua or cheongsam. The set comes with a matching bracelet. A pair of pretty floral earrings accentuates the youth and vibrancy of a young bride. A beautiful modern ring completes the set. 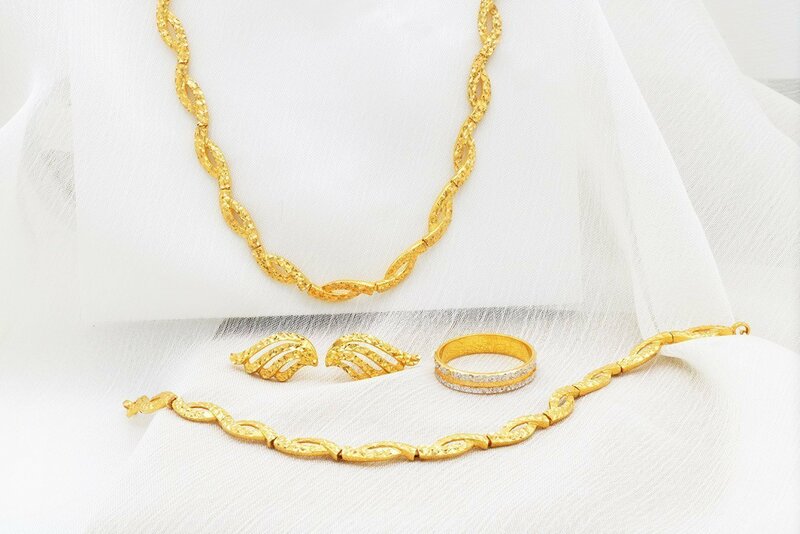 The collection is made of 916 Gold which assures its value and durability across the generations. Delicate yet modern, this collection is picked for an elegant bride who intends to wear her bridal trousseau daily. All pieces fit seamlessly into a young woman’s wardrobe which can be worn and appreciated everyday, a shiny reminder of the beautiful day past. The earrings and necklace in this collection are made of Pure Gold. The ring is made of 916 Gold. This collection features a traditional woven design that signifies the unity and strength of a couple’s marriage. Opulent enough for a tea ceremony yet easy to dress up for a function where you are not the star. This is a matching necklace and bracelet set, complemented with a set of classic winged earrings and a bling ring plated in white gold at its edges. 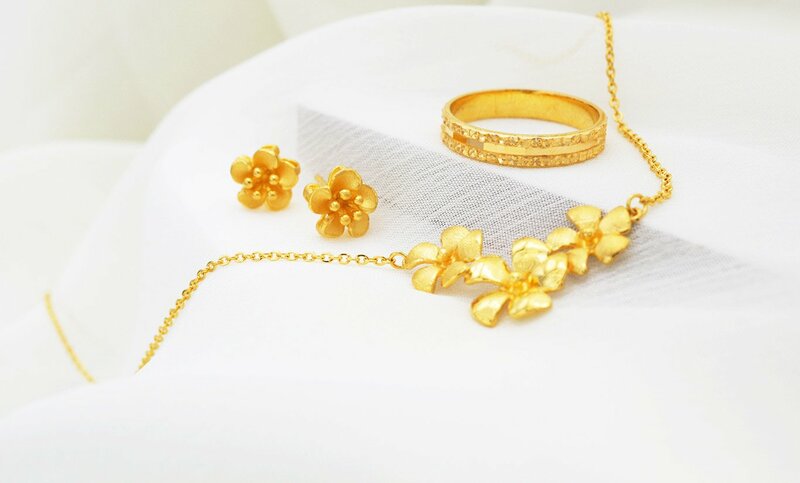 This set is made of 916 Gold. We recognize that all brides are different and offer the service to mix and match your heirloom pieces to your heart’s content. For a bride who fancies the shimmer of diamonds or the elegant lustre of jade and pearls view our Diamond and Jade Collections.